The movement for independence finds itself in a very different context to 2014. 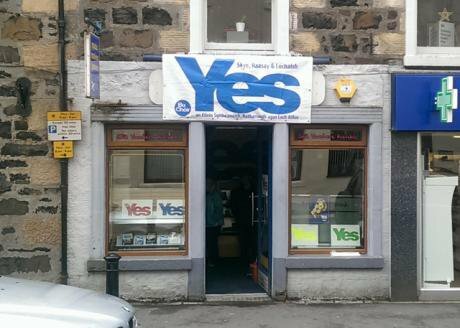 Yes campaign office on Skye, 2016: By John Allan, CC BY-SA 2.0. Scotland has in recent times liked to see itself as progressive, democratic and European. What’s so special about that you might think? A bit like apple pie and being kind to animals. But these undoubtedly mainstream values were rightly seen as increasingly at odds with the direction of the UK in the last few decades. The UK wasn’t any of these things and this has become even more pronounced and obvious since the Brexit vote. However, it was even clear in the midst of the 2014 campaign that there was a problem with these aspirations. Scotland had come to them late in the day of their development. Thus, we aspired to be ‘progressive’ and social democratic, when this tradition has been in retreat and crisis for decades, including within the Nordics. We saw ourselves as more democratic than the limited form available in the UK (a half-elected parliament), but didn’t have practical proposals, while all across the developed world democracy’s decisions and processes are under intense scrutiny: hence the rise in referendums as people increasingly distrust politicians. Moreover, the intuitive idea of seeing Europe as a good thing has become much more questioned, and both the notion of the continent and EU has fallen far since the heyday of 1989, the collapse of the Berlin Wall and what was meant to be in ‘the end of history’ the triumph of liberal capitalism. All of this was evident in 2014 but was generally kept out of the public’s way in the independence case. The supposition then was that by becoming independent Scotland could more fully become the modern nation the UK never was, and in so doing be progressive, democratic and European. However, this case was based in these three areas on a world that was increasingly in retreat: as the centre-left compromised and corrupted itself at the altar of crony capitalism, democracy was increasingly seen as not delivering the results, but being rigged in favour of the plutocrats and 1%, and Europe went from crisis to crisis. In short, the ordered, managed world of independent nation states in the European continent and union working collaboratively for the better of themselves and all, was fraying, not just at the edges, but central core. Brexit has brought all of this even more into the open. We now have a political landscape defined by two competing mandates: Scotland voting to stay in the UK and the EU. The majority of Scots hold this sentiment – wishing to remain in both political unions – but are now told by the UK government that they cannot have both. This has produced difficulties for pro-union sentiment north of the border. The arguments put forward have to emphasise one democratic vote, but ignore Scottish sentiment in the EU referendum, instead stressing that it was a UK vote and mandate. It has also posed a set of problems to Scottish independence opinion. For a start, the UK leaving the EU means that Scotland is faced with an impossible set of choices: being out of the EU in the UK, or being in the EU and out of the UK. The latter brings up all sorts of scary stories about where Scottish exports go (4 to 1 to the rUK over the EU) and nature of the Scottish/English border. Then there is the tricky question of how to build an independence majority when 36% of SNP voters supported Brexit. Those are critical votes which cannot be lost to independence, if it is too have any chance in the near-future. Since the June 2016 vote the SNP have been trying to find a halfway house which allows them some breathing space – keeping Scotland in the single market and customs union. Now both options have been ruled out by Theresa May for the UK and Scotland. Post-Brexit, despite the UK government having a weak hand on Scotland, so far it has to be concluded, May has outmanoeuvred Sturgeon and her administration. This has left Sturgeon this week fulminating about the prospect of an indyref called sooner rather than later, a threat mostly for effect, considering she had earlier ruled out a vote anytime this year. Sources within the SNP have indicated that the party is considering revisiting its policy of independence in the EU and to consider independence outside the EU. Even though former leader Alex Salmond repeated the traditional party position this week on ‘Good Morning Scotland’, this doesn’t preclude the party considering all options and fallback positions. This would most likely entail Scotland being in the single market, paying for access to it and abiding by a whole host of EU regulations. This is the Norwegian option and it is the SNP’s preferred option in the UK presented to the British government – but as an independent country. The SNP are faced post-Brexit with a UK that doesn’t work in the spirit of devolution. Nor does the UK seem to respect the popular will of the Scottish people on the EU as evidenced by the Supreme Court Article 50 decision which said the UK government had to put the triggering of the process to a parliamentary vote, but also said the Scottish, Welsh and Northern Ireland had no veto or right to consultation. This attitude can be seen through British institutions. The Joint Ministerial Committee which brings together the UK and devolved administrations has never really worked. Now this matters. Theresa May promised post-Brexit to develop a ‘combined UK’ approach, but hasn’t made any moves in this direction. All the discussions in the committee have been lacking any substance and undertaken for presentation alone. This British state of affairs is matched by an unhealthy situation in Europe. The EU is not the benign force of progress and economic advancement that it was seen as in the 1980s and 1990s. Instead, expansion combined with the euro has produced Euro-sclerosis. Monetary union without fiscal union has led to economic and social disaster: a Europe which works for the German economy, but which has left devastation across the Med from Greece to Italy, Portugal and Spain. SNP thinking on independence eventually has to move on and catch up with the times. The spirit and hopes of 1988 and independence in Europe: the EU of Jacques Delors and a ‘social Europe’ is no more. Similarly, the plans and aspirations of 2014 and the Salmondnomics vision of independence are equally dead in the water. That doesn’t necessarily mean independence is dead. Any serious politics has to move on. Britain and the EU are regressing. Large parts of the world are entering dark times. The European continent finds itself increasingly squashed between the authoritarianism of Trump and Putin. Scotland and independence has to reflect current and future realities, and not hark back to or get stuck in the past. Independence has to be on the move but the full details of any new package cannot as in 2014 just emerge from a magician’s hat, but have to be as much as is humanly possible, discussed and owned by a large part of Scotland. That will be a big challenge to the SNP machine, which ten years into office, is growing rather comfortable with the view and thinking it knows best. That is a sentiment which has to be resisted, in the full knowledge that it is never a good way of doing politics, or a story which has a happy ending. The SNP and independence cause (which aren’t completely the same thing) have to now be fleet of foot, flexible and avoid being boxed in by May and the UK government, while keeping the foot soldiers happy and reaching out to floating No voters. That is quite an ask in fast changing times, and nothing is yet inevitable about how this pans out for Scotland or the UK. .